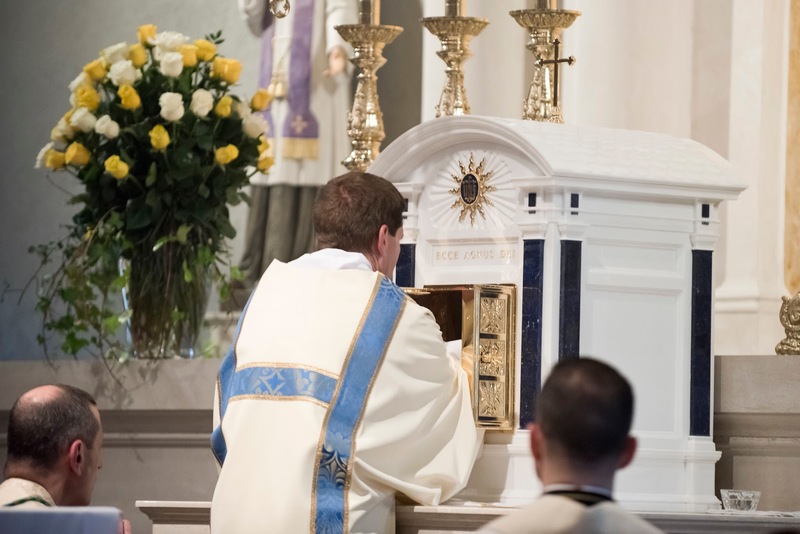 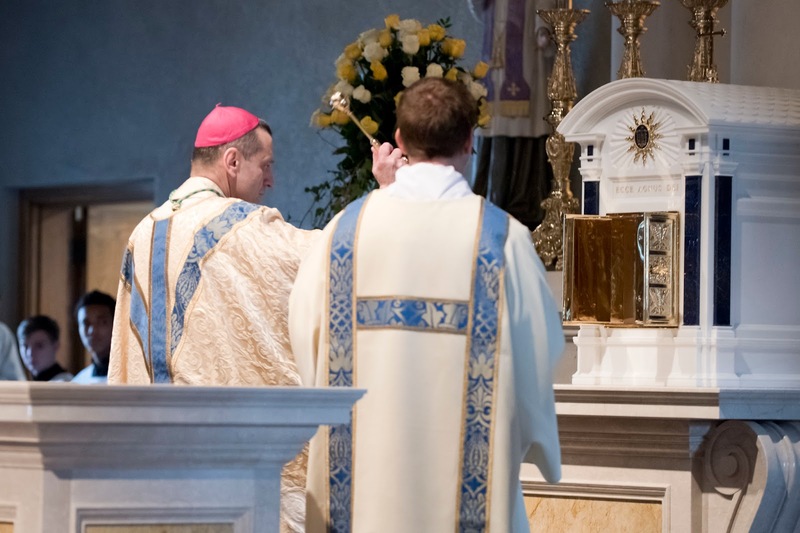 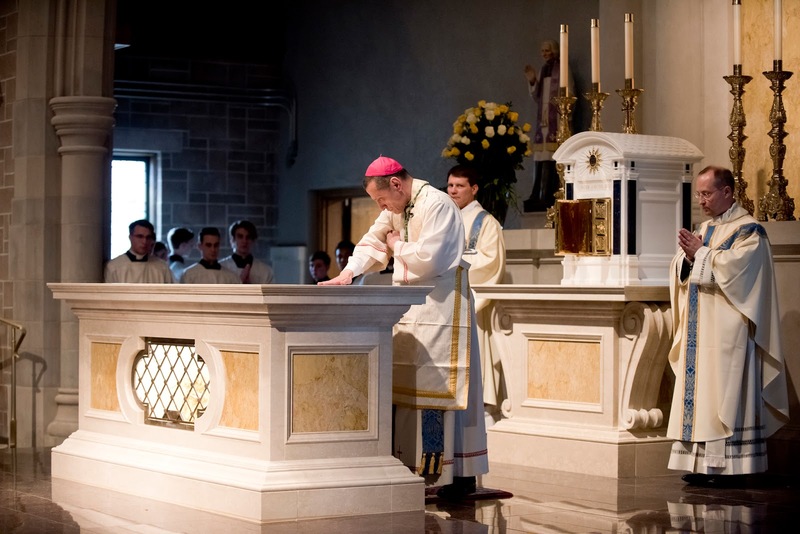 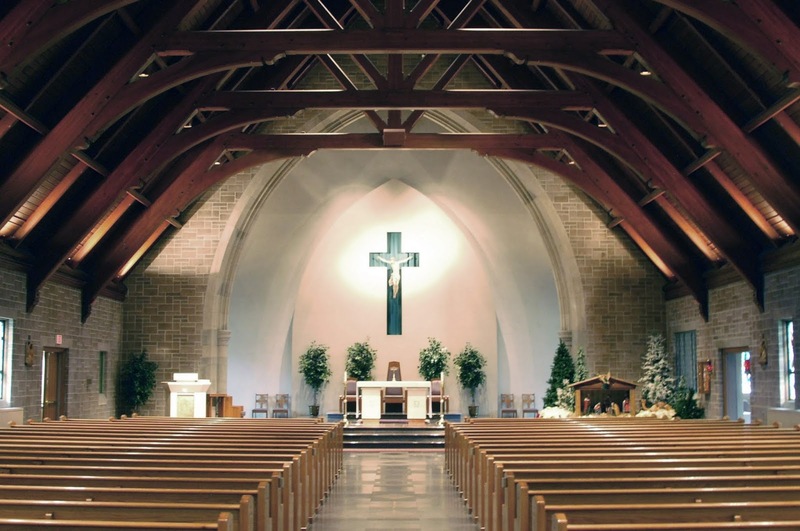 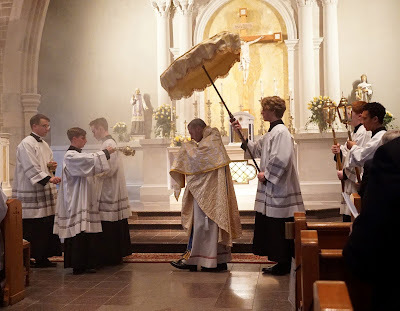 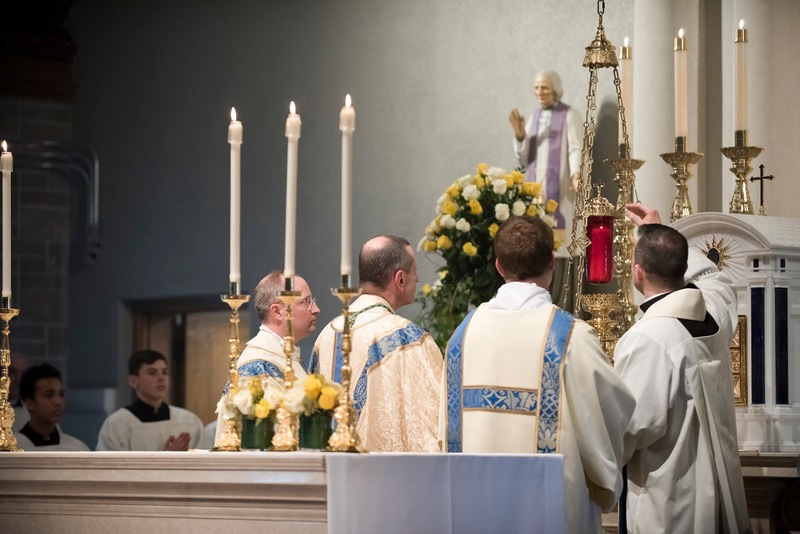 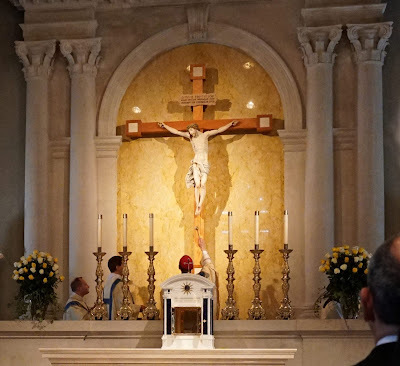 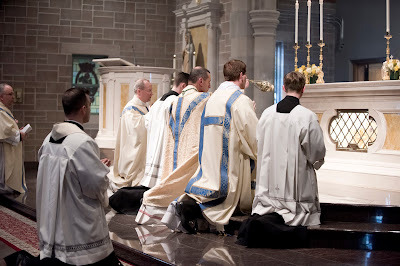 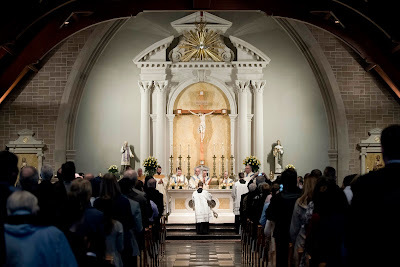 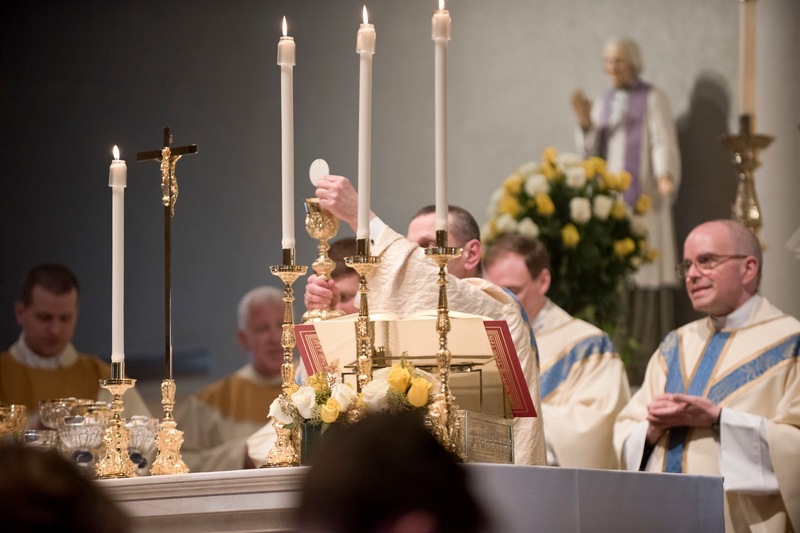 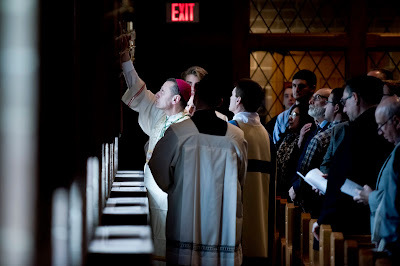 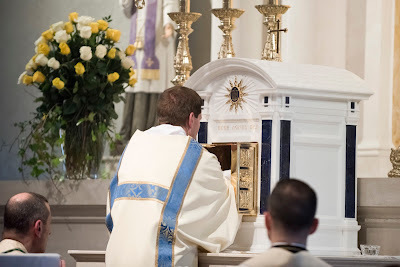 St Catherine of Siena Parish in Trumbull, Connecticut, recently completed a restoration, in which the sanctuary was redesigned, a new altar of sacrifice was created, and the tabernacle was relocated to the center of the church. 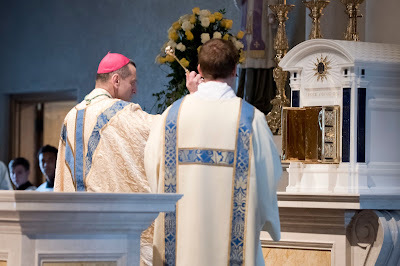 Last month, we posted photographs of the deposition of relics, which was done preparatory to the dedication ceremony; the church was built in 1958, and blessed for liturgical use, but somehow, never consecrated, even after its mortgage was retired. 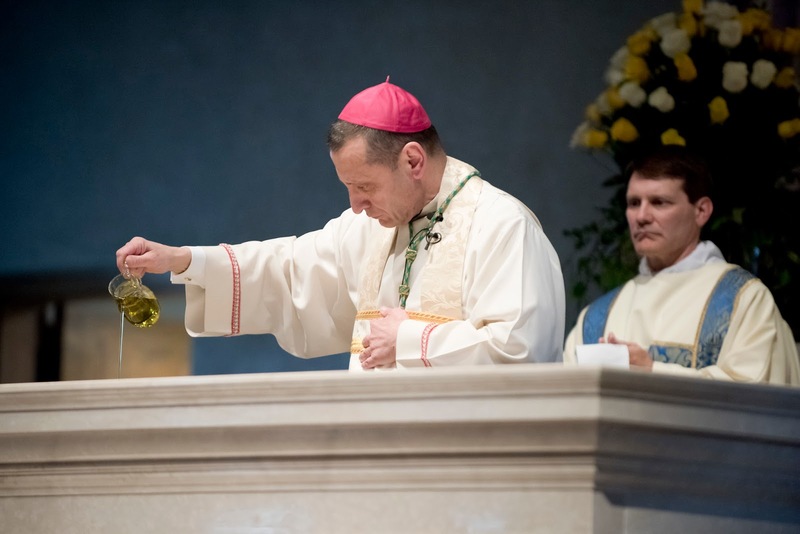 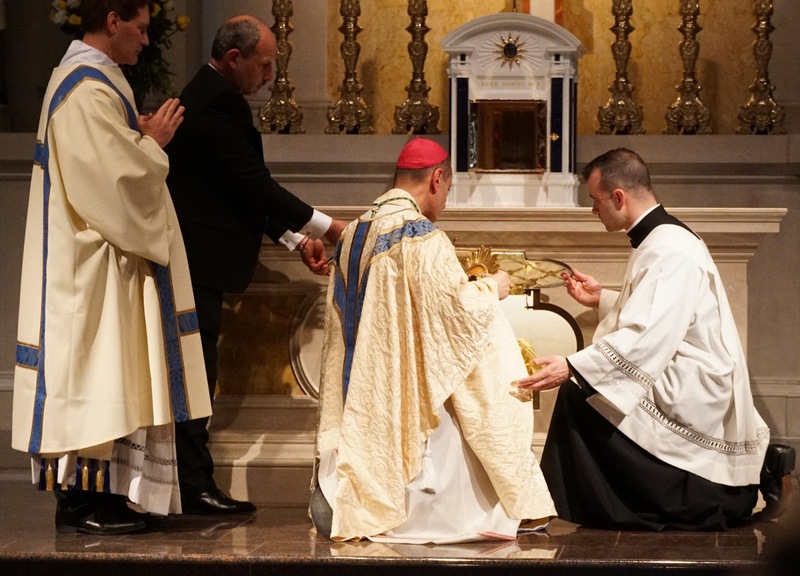 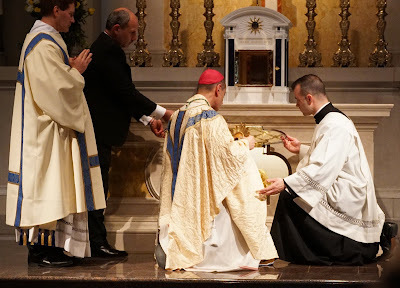 The Mass of Dedication and consecration of the church were celebrated on Sunday, March 24, by the Most Reverend Frank J. Caggiano, Bishop of Bridgeport, a tangible manifestation that Christ is alive and working in the Church, even during the most difficult of times. 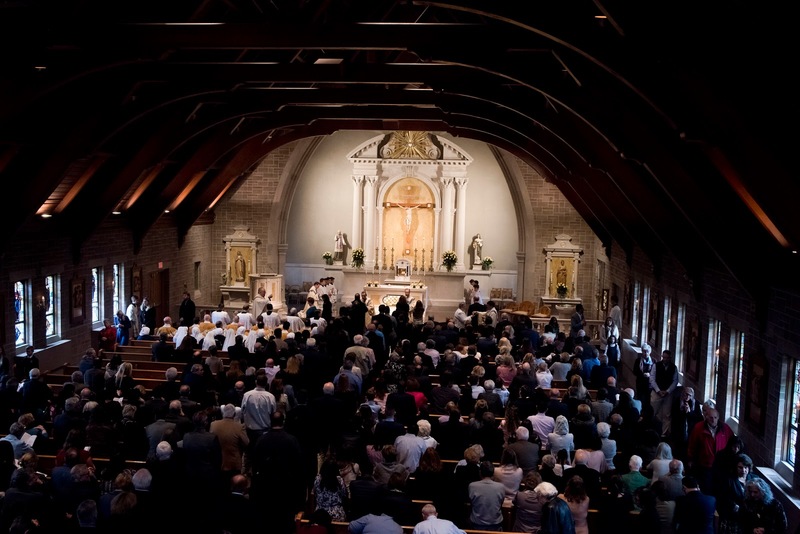 The architect for this project was Duncan Stroik, who was present for the celebration. Our congratulations to him, and to the pastor, Fr Joseph Marcello, on the success of this much needed and beautifully done restoration. 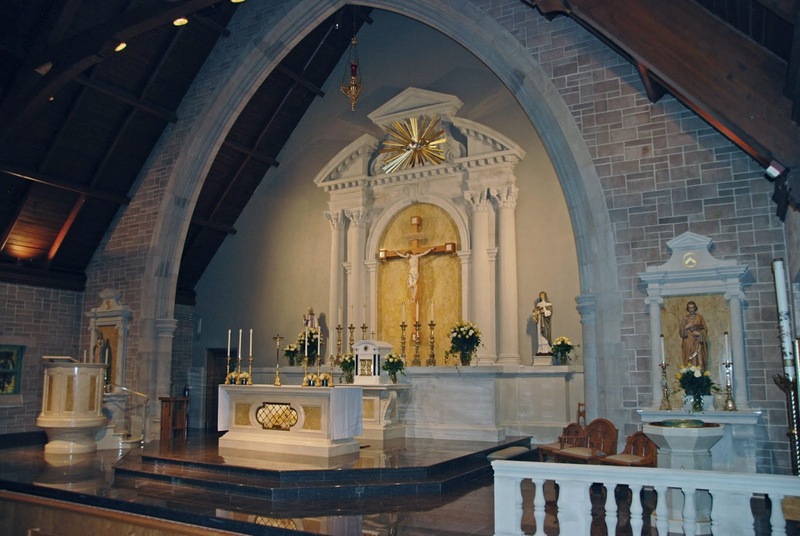 The tabernacle has been moved from a side chapel to the center of the sanctuary, which has been graced with statues of the Blessed Virgin Mary, St Joseph, the patron Saint, Catherine of Siena, St John Vianney, the patron saint of priests. The side chapel is now a Memorial Chapel of prayer for the faithful departed; the church’s former altar has been relocated there, where it fits perfectly. Above the altar is a statue of the Sacred Heart of Jesus, newly restored, which was given to the parish at its founding. 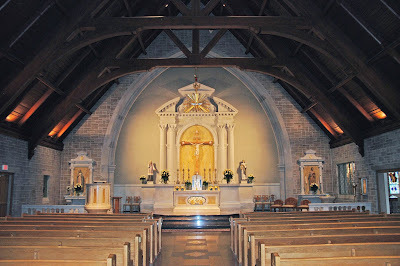 The chapel contains a memorial book with the name of every person whose funeral has been celebrated at St Catherine’s since its founding in 1955; it also houses a beautiful mosaic of Our Lady, and which hangs as a memorial to children who have died before their birth. Here are some photographs of the consecration service; some of the highlights are also presented in a video which you can watch here. The lustrations of the various parts of the church. The relic of St Catherine is placed in the main altar. and of the consecration crosses. 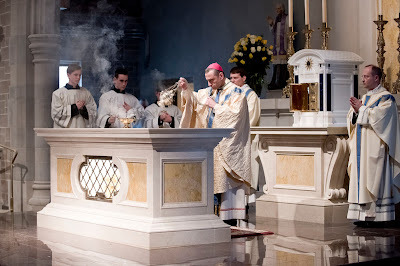 The candles are lit for the first Mass. and carried in procession through the church. 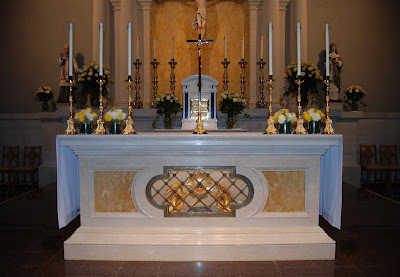 and the sanctuary lamp is lit for the first time.